The Burgundy (and Champagne) Tour 2016 by ombiasy WineTours took place from May 26 to June 05, 2016. We experienced French hospitality and culinary art at the highest level. We had a luncheon at the iconic Paul Bocuse restaurant at the doorsteps of Lyon, dinners/ lunches at village restaurants serving typical Burgundian dishes and meals at fine dining restaurants. 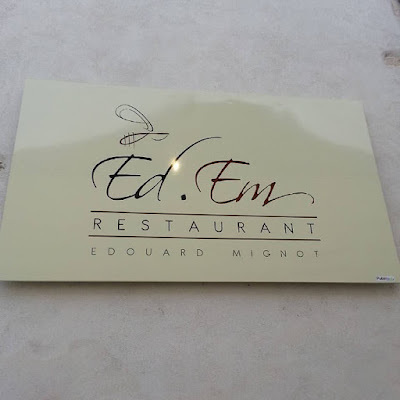 With regard to the latter, we had a super dinner at Restaurant Ed.Em in Chassagne Montrachet. 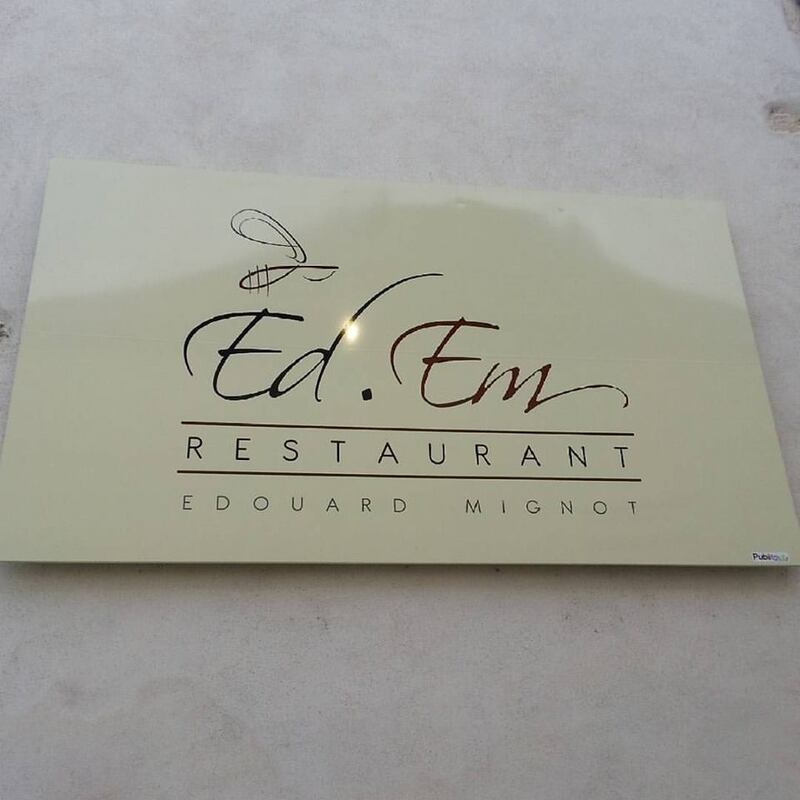 Ed.Em is among the top restaurants in the Bourgogne, with 1 Michelin star. Karoline Knoth from Meursault, who had guided us through the vineyards of Meursault in the afternoon before the dinner, joined us at Ed.Em. The dinner was a set menu, pre-ordered by Annette Schiller for the whole group. Participamt chose their own wine. Michelin: The name is a contraction of Édouard and Émilie, who have taken over the premises of the former restaurant, Chassagne. He is a young chef with an impeccable CV (Lameloise, Marcon) who combines personality and subtlety in his tasty set menus where delicacy is never missing. She is a pastry chef and guarantees to round your meal off with a flourish. Hurry! Cellar Tours Fave Restaurants in Burgundy and Beaujolais for Wine Lovers (November - 26 – 2014): No gastronomic journey through Burgundy can omit L’ Ed Em, a restaurant as mythical for its incredible selection of white Burgundies as its superlative cuisine. Head Chef Edouard Mignort is one of the greats, having studied in Paris and Burgundy under the tutelage of various 3 Michelin starred masters, he finally achieved his dream of opening a restaurant of his own with his charming wife Emilie last year. It quickly built a mighty reputation for warm hospitality, professionalism and precise, mouth-watering cuisine executed with flair. The whole experience feels slick and polished, but without the pretension that can so often plague fine dining establishments in France. Karoline Knoth also presented to us her new book "Allons en vendage". The key to Edouard’s culinary flair is his unwavering obsession with only the finest, seasonal ingredients, “everything else rests on this foundation,” he says. With this arsenal of great produce, he crafts such delights as Breton lobster and octopus, Bresse chicken with a red pepper sauce and shallot cream, not to mention strawberry poached in red wine with Chantilly cream and mint sorbet. The cheese selection, including, of course, the legendary Epoisses, is one of the best in the Cote d’ Or, as is the generously well-stocked wine cellar, containing many of the region’s most famous names with prices to match.